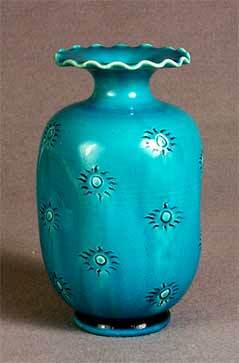 Decorated Burmantofts vase - 6¼" (158 mm) high. Burmantofts Pottery, as it is usually known, was only actually called Burmantofts for a very short period of the ninety-nine year that the company was producing ceramics. Originally established by William Wilcock and John Lassey, it was set up in the Burmantofts district of Leeds, Yorkshire in 1845. The two men intended to mine coal on the site they had bought, which they did for thirteen years, but they found clay there and in 1858 started to use it for making bricks and pipes. John Lassey died that year, but his wife carried on in his stead and the company was known as Wilcock & Co. In 1863 Margaret Lassey sold her share to John Holroyd, who passed the management of the company seven years later to his son Ernest. Ernest, in turn, gave way to his brother James in 1879. By this time both William Wilcock and John Holroyd had died. James started the production of 'architectural faience', and during the next decade the company started producing vases, jardinieres and suchlike. The new ranges sold well and in 1888 the company opened its own showroom in London and changed its name to The Burmantofts Company. The new name was short lived though - the following year Burmantofts merged with five other Yorkshire companies to form the Leeds Fireclay Company. Some twentieth century Burmantofts pieces are marked 'Lefico' from the first two letters of each of these words. The year after that James Holroyd died and was succeeded by his son, James junior. The company flourished until the turn of the century, but in 1904 when sales of art pottery were flagging, it reverted mainly to production of architectural pieces. Production finally ceased in 1957. Early Burmantofts pottery was quite plain; typically bulbous vases, often with long slender necks. More ambitious glazes followed, sgraffito decoration was used, and the designs became more and more ornate. The use of applied insects and serpents was popular. Many workers were taken on from the Linthorpe Pottery when it closed in 1889 and the styles produced were close to those of Linthorpe. Notable designers were B Sicard and V Kremer.